Currently the forums are publicly readable, but posting requires registration and logging in. Switching from mailing lists to online forums is a big cultural change for the community. To make the change easier, we will soon be adding alternative access options to the forum contents including RSS and email subscription. In addition to the email subscription system I’m working on, new software coming from this migration was a mbox-to-forum converter to the Exorcist package. Updated 14:14Z: There are now RSS feeds available for the user forum and the developer forum. 13 June 2010. 7 minute read. A bit of folklore... 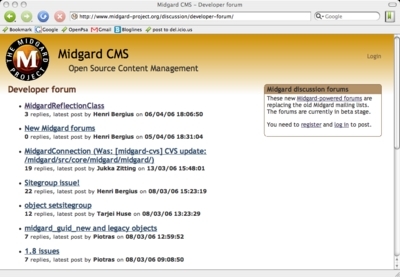 The Midgard releases have usually been named after some current event in the community. If no fitting events have been around, then names have been taken from Viking mythology.